In May 2008, a ‘peace line fence’ was erected in the grounds of Hazelwood Integrated Primary after Catholic homes were attacked close to the school. Ten years on, the 25ft-high interface barrier is still in place. To mark this anniversary, Kathryn Torney visited the north Belfast school to speak to the principal and pupils. NEW visitors to Hazelwood Integrated Primary are unlikely to realise the significance of the high mesh fence which lines one side of the school’s grounds. It’s not a solid wall and you can easily see through the gaps to the residential houses on the other side but the symbolism of the structure remains dense and heavy. The ‘peace wall’ fence was put up in May 2008 following attacks on Catholic homes in the nearby Throne Park area. It was thought that the perpetrators had been crossing through the Whitewell Road school's grounds to gain entry to the area. 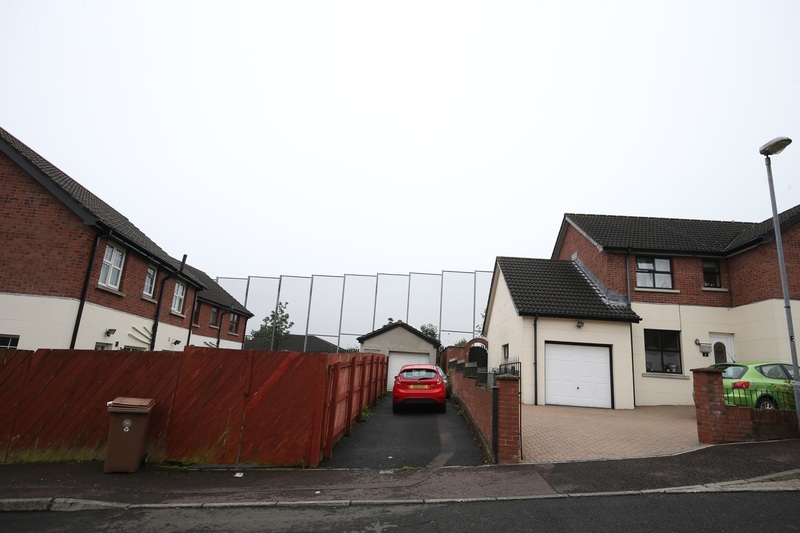 The Northern Ireland Office said in 2007 that the decision to put up the fence had been taken after extensive consultation with residents, political representatives and the school and on advice from the PSNI. The estimated cost was £100,000. The irony was clear from the beginning: The structure was put up to separate communities within the grounds of an integrated school which educates Protestant and Catholic children together and has the specific aim of breaking down barriers between people. The plan for the fence was confirmed just weeks after the then Secretary of State Peter Hain insisted that the Government was committed to removing barriers dividing communities in Northern Ireland, and as a new era of power-sharing got under way at Stormont. It is one of over 100 interface barriers still in place across Northern Ireland. There is a government commitment to remove them all by 2023. The Department of Justice told The Detail last week that community consent is central to any physical change to interface structures and that dialogue is continuing around the future of the fence at Hazelwood Integrated Primary. Hazelwood Integrated Primary pupils at the 'peace fence'. Photograph by Chris Scott. Patricia Murtagh was vice-principal in 2008 when the fence was put up. She is now the school’s principal. “We were quite generally concerned about the whole thing because the irony wasn’t lost that we were an integrated school and there was the possibility of a peace fence dividing the community that we were trying to bring together,” she recalls. “At the beginning we facilitated the meetings for the community to come together and very definitely put a strong case and wrote letters back and forward to the Northern Ireland Office about our concerns. But in the end the Northern Ireland Office at that high level made that decision because of the nature of the concerns that people had around their public safety, the safety of their families, and at the end of the day that had to be the main driver. “It was a very difficult decision for us as an integrated school because we knew that we had the children of the families involved in both sides in this building, getting on well together, enjoying each other’s company and learning about each other’s differences and similarities. She would like to see the fence removed or at least reduced in height – as long as the local residents agree to this. “I would go out there every day and look at it and think wouldn’t it be great if we could make some changes. Make it reduce in size or do something to make a statement again about how the community has moved on from those difficult issues. The fence is used as an educational tool with the school’s older pupils. Mrs Murtagh told us: “Our P7s read The Boy in the Striped Pyjamas which is a very, very powerful children’s book. For the last little bit of it they actually go out and stand by the fence to have the last chapter read to them. Principal Patricia Murtagh. Photograph by Chris Scott. Mrs Murtagh said she would be “very disappointed” if the fence was in place as it is for another ten years. “I think it’s a very interesting aspiration that the likes of the Department of Justice have now in reducing or taking down the peace walls and peace fences because the symbolism that is there for those fences is extraordinarily strong,” she said. We spoke to Primary 7 pupils Jude, Amber, Jamie and Gabrielle and asked what they think of the fence. It was a non-uniform and ‘Mad Hair Day’ when we visited the school. Gabrielle (11) agreed. “It’s been there for 10 years and the people that made that fence go up, they’ve grown older and might have grown more mature and wouldn’t do what they did. It should be taken down. Throne Park: The other side of the Hazelwood fence. Photo by Press Eye for the International Fund for Ireland. The International Fund for Ireland (IFI) Peace Walls Programme was launched in 2012. It works with interface communities with the aim of helping residents reach a position where they feel it is safe and appropriate to proceed with the removal of peace walls in their area. The programme’s strategic objectives include encouraging contact, dialogue and reconciliation between unionists and nationalists in interface areas. As part of the programme, Greater Whitewell Community Surgery gathered survey data from 88 of the most impacted residents at four identified ‘peace wall’ sites – Serpentine Road/Navarra; Graymount/Lower Whitewell, Hazelwood/Throne and Serpentine Gardens/Gunnell Hill. The survey, published in October 2017, found 80% of respondents wanted to see some change to the barriers – whether that be ‘reimaging’, reclassification or removal. Only 12% of residents in the area favoured the total removal of the walls now and 87% said they did not want their children or grandchildren to continue living with the barriers. We asked the IFI to comment specifically on the Hazelwood/Throne fence. Dr Adrian Johnston, chairman of the International Fund for Ireland, said: “Peace barriers are symptoms of division rather than causes of it. “The Hazelwood fence was erected at a sensitive time in this area and should only be altered when the residents most impacted by it agree that it is no longer required in its current form. “For change to happen, residents will require assurances that the concerns raised during consultation and our baseline survey have the support of an appropriate aftercare package. “Through our Peace Walls Programme, Greater Whitewell Community Surgery is currently engaging those residents most impacted by the Hazelwood fence in an effort to build the trust and conditions necessary for them to consider how change might improve their lives. The International Fund for Ireland has never adopted the government’s 2023 deadline for the removal of all walls and instead has stressed that communities must be able to move at their own pace. We asked the Northern Ireland Office to comment on the fence and its future but were told it wasn’t a matter for the NIO and that we should contact the Department of Justice (DoJ). A DoJ spokesperson said: “The fence at Hazelwood Integrated School was put up in 2008 by the NIO. In April 2010 under the devolution of justice functions the Department of Justice took responsibility for it. “The ‘Together: Building a United Community’ strategy commits to working towards the removal of all interface structures by 2023. In taking forward this work the department has been engaging with the Greater Whitewell Community Surgery for a number of years to explore alternatives. “The Greater Whitewell Community Surgery, funded through the International Fund for Ireland peace walls programme, have led on engagement with the community and the school. To read more about the International Fund for Ireland’s Peace Wall Programme, click here. Read Cormac Campbell's previous story for The Detail on peace walls here.